Many organizations use Maintenance Windows as part of their Software Update deployment strategy. Maintenance Windows in SCCM are commonly used for controlling when updates are allowed to be deployed to servers. Unfortunately, this feature is not available for Maintenance Windows, which causes an issue that I describe in this blog post. Maintenance Windows are used to control when deployments are allowed, and can be compared to traditional service windows where you would manually patch servers during the weekend. Why would you deploy Maintenance Windows you might ask? Yes, you can configure different deployments with different deadlines for Software Updates. Maintenance Windows however allow you to add an additional layer of security, preventing accidental deployments. Theoretically, you should be able to deploy all software updates to all devices and then configure when they are installed using Maintenance Windows. Maintenance Windows are configured on collections. Maintenance Windows will have precedence over Deadline times. When several Maintenance Windows are deployed for a device, all Maintenance Windows will be used. When deploying Software Updates to servers you most likely want to do this during non-office and/or low-production hours. On the 2nd Tuesday of every month, Microsoft releases updates, which in other words is called Patch Tuesday. Out of band, or Critical Patches are deployed during the month as required. If I want to deploy the patches on the weekend, one week after Patch Tuesday, it would be reasonable to configure the Maintenance Window to be available on the 3rd Saturday and 3rd Sunday. As you can see in the below calendar, Patch Tuesday (2nd Tuesday of the month) will be wrong. If I configure that it should be available every 2nd Saturday or 3rd Saturday, it will not be the same for every month. In order to alleviate this, I have created a Powershell script for creating Maintenance Windows based on Patch Tuesday. The scripts are located in the TechNet Gallery. When creating the Scheduled Task, it should not be run in a regular user context, but as a service account. The service account will need to have access in SCCM to be able to create and remove Maintenance Windows. The “law” of minimum permissions should be followed. Giving minimum permissions should always be top of mind when implementing a successful Role Based Access Control strategy. Create a standard account in Active Directory and make sure that the password doesn’t expire. Add the service account to the pre-defined Maintenance Window role. Right-Click and press Create Basic Task. Give the Basic Task a Name. Select which Months the Schedule Task should run. Define which Days the Scheduled Task should run. Enter the information from the table above. 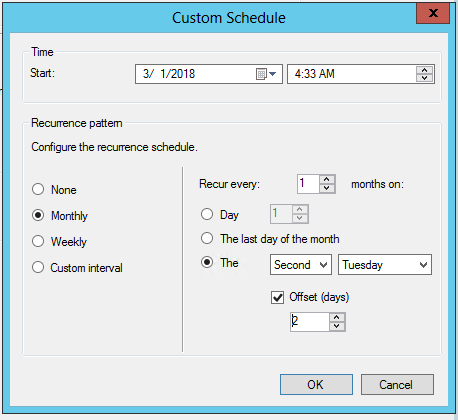 Configure the Scheduled Task to run with a service account. In summary, using Maintenance Windows are a powerful way of controlling when Software Updates are allowed to be installed. It is just important to understand how they work.